Take glass bottom boats to a whole new level! You're not just looking down on the underwater world of Cabo San Lucas, you're actually part of it! Our semi-submersible submarine will let you see and enjoy the underwater world like no other vessel in Los Cabos. On no other tour do you get underwater views of El Arco (The Arch), the Sea Lion Colony, and Neptune's Finger - this is exclusive territory of the Yellow Submarine! As you gaze in wonder at the underwater ecosystem, your captain will share his expert knowledge of the local marine life, rock formations, and history and development of the area. When you've reached your destination, the captain will swim down and find sea urchins, jellyfish, sea horses, and sea stars to share with you up close through the underwater viewing window. If you want an even closer view, we supply snorkeling equipment - you can go snorkeling with him! For fun vacation photos, swim down in front of the viewing window while your family or friends take pictures of you from inside! If you'd like, you can relax on deck and get some sunshine and take top-side photos of Cabo and The Arch as well. 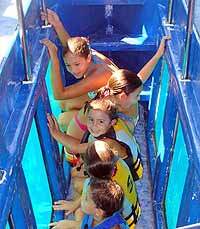 This eye-opening tour is great for the whole family - swimmers and non-swimmers alike. There's something for everyone! Cruise Passengers: Yes! This tour is perfect for a cruise shore excursion. From walking Distance of the cruise pier. Three times daily at 10:00 AM, 12:00 PM, 2:00 PM and 4:00 PM, April through November only. Next to the Nowhere Bar on the Marina in Cabo San Lucas. Walking Distance from the cruise pier, or anywhere downtown. Submarine Tour, Expert Naturalist Guide and Captain, Snorkeling Equipment. All ages welcome. Kids under 5 are free. Ages 5-12 are half price.